Goodreads: Jay Porter is hardly the lawyer he set out to be. His most promising client is a low-rent call girl and he runs his fledgling law practice out of a dingy strip mall. But he's long since made peace with not living the American Dream and carefully tucked away his darkest sins: the guns, the FBI file, the trial that nearly destroyed him. Houston, Texas, 1981. It is here that Jay believes he can make a fresh start. That is, until the night in a boat out on the bayou when he impulsively saves a woman from drowning—and opens a Pandora's box. Her secrets put Jay in danger, ensnaring him in a murder investigation that could cost him his practice, his family, and even his life. But before he can get to the bottom of a tangled mystery that reaches into the upper echelons of Houston's corporate power brokers, Jay must confront the demons of his past. Kritters Thoughts: It is 1981 and although the civil rights movement is in the past, some places are still living as if it didn't occur. Jay Porter is an African American lawyer who is trying to obtain a better life for his family and neighbors despite the corporations taking advantage of his neighbors and causing problems. At the same time Jay is also still dealing with past mistakes and they will haunt him for his lifetime. Jay was an interesting character and there were almost two plots going on at the same time - they definitely intertwined but I kind of wish they had intertwined quicker. There was quite a huge cast of characters and I had to make an org chart to keep them all in line and to remember who belong with each storyline and how they fit in relation to others - warning, it did get confusing. With patience I got everyone under control and was able to enjoy the storyline. I read this book because I was given the sequel - Pleasantville to review, review to come tomorrow and I am glad I read it. It provided the details for Jay's story and I am not sure I would have liked Pleasantville without reading this one. 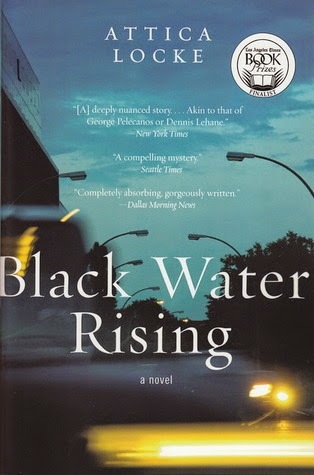 Although Pleasantville takes places years later, I think starting at Black Water Rising helps the reader get some perspective on this character.